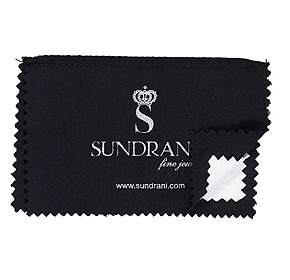 The Cleaning & Polishing Cloth is made from a soft 100% cotton flannel material that is not abrasive and is soft enough for your finest jewelry in gold, silver and platinum. You are having two cloths in one with this product! The inner cloth (white) cleans jewelry with tarnish inhibitors and a special non-toxic formula to wipe away dirt, make-up, dead skin, body oils, food, finger prints, and any crud that gets on your jewelry! Then, the outer cloth (black) polishes and shines your jewelry to have a luster and brillance like new!